Permanently bonds fabric with no sewing. Washable and dry-cleanable over and over without ever falling apart. 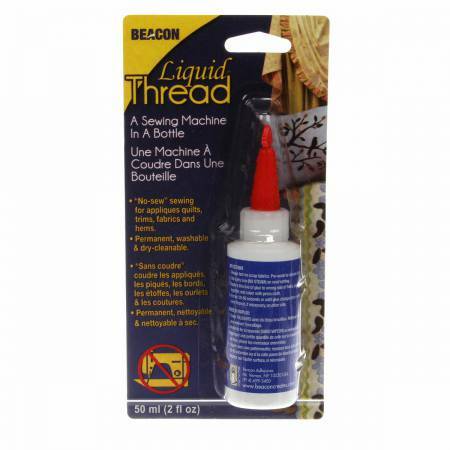 Ideal for applying appliques, creating no-sew quilts, making hems and seams for wearables, home décor and craft projects. Applies foil to fabric in one quick and easy step. Fusible when wet or dry for maximum convenience. As easy to use as ironing; mistake-proof, washes out before ironing. Not recommended for thin, sheer, or delicate fabrics or any fabric that cannot withstand heat. LIQUID THREAD can be washed away anytime before ironing. Adele's tips: Use to "paint" applique edges for total control of where your fusible is to prevent that heavy stiff feeling. Can be diluted with water if needed. Use a bottle cap to hold small amounts of glue.